The biggest experience in the country treating congenital vascular anomalies. 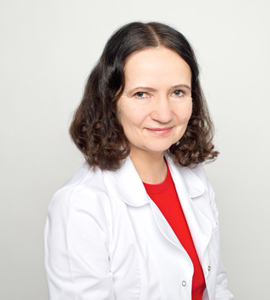 Birutė Vaišnytė, MD, PhD Head of vascular surgery department of Vilnius university hospital “Santariškių Klinikos”, head of center of vascular malformations, member of Lithuanian Association of Vascular surgeons. Trained in Moscow (Russia), Herne, Dusseldorf, Berlin, Hamburg (Germany), Boston (U.S.A), Brussels (Belgium), Malmo (Sweden) and Melbourne (Australia). The biggest experience in the country treating congenital vascular anomalies. Expert of vascular malformations treatment, also more than 30 years experience in the field of surgery of venous diseases, arterial atherosclerosis, lymphostasis and vascular thrombosis treatment.